John Grisham's The Racketeer follows a disbarred lawyer who schemes revenge against the pursuers that influenced his 10-year conviction. 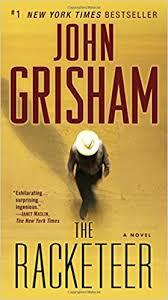 ...The Racketeer is an unusual book for Mr. Grisham. Unlike many of his others, it has no soapbox to stand on and is not out to teach lessons about justice ...is much more duplicitous than that. In its early stages it does follow the familiar Grisham template, in which a lawyer finds himself unexpectedly in legal trouble ...this is not a story about a triumph or a miscarriage of courtroom justice. It’s the more devious, surprising story of a smart man who gets even smarter once he spends five years honing his skills as a jailhouse lawyer — and then expertly concocts an ingenious revenge scheme ... Mr. Grisham writes with rekindled vigor here. Perhaps that’s because he hasn’t mired this book in excessive research. ...carries the reader along one track (innocent man seeks exoneration) only to switch on to another (cat-and-mouse caper) halfway through with delicious, frictionless ease ... It's once Bannister is sprung that the fun begins. His voice, previously so pleading and persuasive, acquires malice as the force of his hatred of the FBI becomes apparent ... That we would never be able to guess has led some critics to accuse Grisham of not 'playing fair' with his readers ... Grisham's genius here is to withhold the frontstory too, even as it unspools away from us. Let's make a deal isn't a game show –– it's a con game –– in John Grisham's latest legal thriller. And if all goes according to plan, The Racketeer's Malcolm Bannister is going to game his way out of a federal prison camp in Frostburg, Md ...as in any decent thriller, that's not all there is to the story ...best thing about The Racketeer comes, in part, from an appreciation for the time and calculated thinking that Grisham, the author of more than a dozen legal thrillers, has invested in his clever, twisty plot ... This is the kind of story that built Grisham's reputation as a lion of the literary thriller. The Racketeer is guilty of only one thing: keeping us engaged until the very last page. What did you think of The Racketeer?